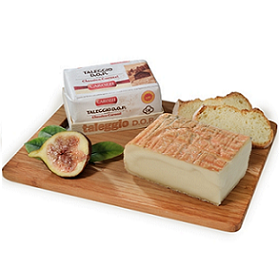 Taleggio is a cow's milk DOP cheese from the Valsassina area in Lombardy, Northern Italy. As it matures over 6-10 weeks, it is washed with sea water weekly and forms a thin crust. Deliciously creamy, with a strong aroma yet relatively mild, buttery flavor with a touch of tanginess. In addition to being a lovely table cheese, it is an excellent cheese to melt into many dishes - from polenta to pasta dishes and pizza or for a stellar grilled cheese sandwich.